January is the time when we turn our attentions to three things – dieting, worrying more than usual about money and (thankfully!) seeing what new arcade games are on the way at London's ATEI show at Earls Court. This year, with plenty of tasty treats promised at ATEI from both the bigger Japanese arcade giants and a number of smaller developers, TechRadar is particularly happy to hear that we will finally get to play Konami's Guitar Hero Arcade. And if that wasn't good enough news, we'll also get some hands-on time with Sega's beefy Hummer racing game and Namco's Games' two-player shooter Razing Storm - based on PS3 hardware – which in Kevin Williams' opinion, "offers the biggest gun game action for some time, with vibrating machine pistols for the player and ultra-destructible levels." Editor of arcade trade newsletter the Stinger Report, Kevin Williams, told T3 recently: "The market now represents 'public space' gaming - game experiences in hardware unachievable at home. "This means motion, big display, unique interfaces and tournament networking for prizes," Williams added. T3 also notes that lesser-known companies such as TrioTech will be showing off such "eye-poppingly, body-shaking delights as the 'UFO Stomper' (featuring an interactive floor display) and the epic 'Typhoon' motion simulator cabinet, which goes so far as to simulate effects such as wind, putting you in the game like never before." Guitar Hero Arcade developer Raw Thrills' VP Andrew Eloff told MTV Games earlier this month that the arcade game was pretty unique, noting: "It's Konami and Activision and Raw Thrills all working together. "Konami has all this experience with doing coin-op games and Activision has the number one domestic music game. So, I think it's kind of a match made in heaven. It makes a lot a lot of sense. "The thing with Guitar Hero that's so frightening is there's so much licensing [music, patents] associated with it. We're not set up to do all that. When Konami came to us, asking us if we wanted to develop Guitar Hero, we felt like this was a perfect symbiotic relationship." 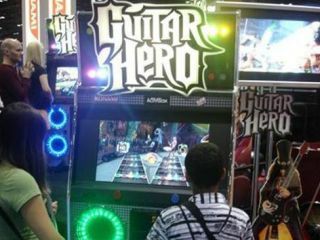 Guitar Hero Arcade is based on Guitar Hero III: Legends of Rock. For T3's full ATEI preview head over to T3.com now.